Certified facilities to host your mission-critical data, applications, and websites. 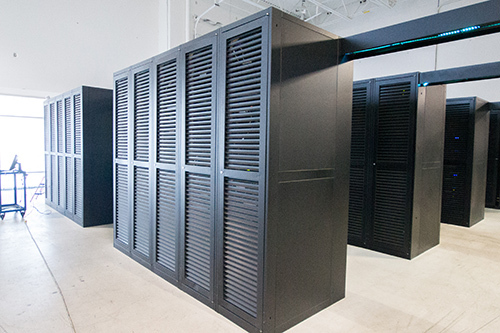 eSecureData's DC3, the company's first fully constructed data centre in Canada, is strategically located in the heart of Coquitlam, British Columbia, in close proximity to downtown Vancouver. The choice of location is no coincidence as it provides geographic diversity from the company's DC1 facility (located in downtown Vancouver) and it affords a latency of less than 2ms from the metropolis. It is the optimum location to host your IT infrastructure. The Network Operations Centre (NOC) staff monitors the network 24/7/365, while our network engineers and facility staff are available around-the-clock by phone or online in case of an emergency. We’ve taken every precaution to ensure the security of our infrastructure. We maintain multiple security zones for monitoring incoming and outgoing visitor traffic for any room that contains servers and networking equipment. Our facilities are enclosed with secure electrical distribution areas and generators. We also have permanent 24/7 physical security services, biometric systems, recorded video surveillance, and a strict access control system. eSecureData was designed with a focus on reducing our impact on the environment. We are an active member of the Green Business Bureau, and we utilize an industry-leading data centre infrastructure management system that helps us optimize our equipment and maximize energy efficiency. Since 2014, we’ve been a leader in air flow innovation using a proprietary system called A.R.I.E.S (Air Recycler Inflow Exhaust System) that reduces power consumption by as much as 35%. eSecureData utilizes 100% BC Hydro power that is backed by uninterruptible power supplies and fully tested diesel generators. We test our power-fail systems monthly and give customers the ability to utilize standard power and high-density power configurations. Our Network Operations Centre (NOC) staff and certified data centre engineers manage every aspect of our facility. They are experts on security, hardware deployment, and handling customers' needs. Our team is available to support you by phone or online around-the-clock. eSecureData provides multiple upstream services from leading regional carriers as well as access to several long-distance fibre optic networks that link directly to the Vancouver Internet Exchange (VANIX), connecting you to one of North America's primary peering facilities. You can expect latency of less than 2ms to the downtown corridor and 50ms to the east coast. eSecureData meets all Canadian privacy requirements and is located just outside of Metro Vancouver. It is uniquely located and built on top of bedrock using reinforced concrete block construction with direct connectivity to Harbor Centre and multiple regional carriers. Looking for services in Toronto, O.N?